Do you think Canadians build igloos or snowshoe for their sole source of exercise? Do Australians surf and box with kangaroos? Have you ever wondered how people in different countries get fit? Inspired by military obstacle course training in France in 1988, parkour involves running, jumping, leaping, and walking on all fours to overcome obstacles. Climb up walls and do back-flips like an urban Spiderman…if you dare! This modern and ‘calming’ form of martial arts involves redirecting the actions of your attacker, instead of opposing them. If you want a mental workout, aikido is for you! Even though it was created by a Belgian, Bossaball is popular in Spain. This form of volleyball incorporates elements of gymnastic, soccer, and capoeira…all on an inflatable court! A Brazilian martial art which blends martial arts with dance, acrobatics, and music. 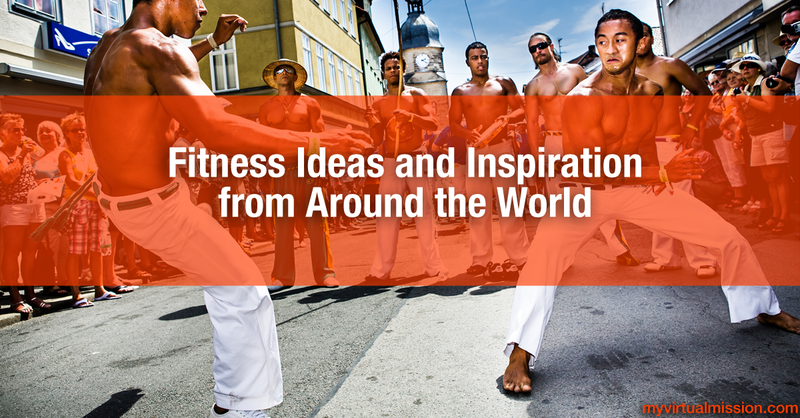 If you’ve always wanted to do flying kicks to background music, capoeira is perfect for you. With the rise of concern over fitness and personal health, trampoline centres have been popping up all over Canada. Jump your hearts out to get shapely calves, people! If you crave a little more pull in your muscles and a little more adrenaline rush in your yoga practice, aerial yoga may be the answer to your fitness snoozefest. Hang upside down from swatches of silk and your upper body will be stronger in no time. One-on-one personal training can be awkward or dreadful and super expensive. The UK is loving group personal training sessions right now – gather your friends and save some money while getting fit! Everyone’s a little more concerned about ol’ Mother Earth these days (and the galactic gas prices!) so bicycling has increased in popularity tenfold over the past couple of years. Save the world AND have a taut, firm core with shapely, strong legs? Who doesn’t wish for that?! Do you know of any fitness trends in other countries around the world? How do people thousands of miles away #KickTheExcuse?